of Kyiv – Podil. It is a unique place, where you can alight during leisure travel or business trips or hold celebration events or to rest in a civilized manner in Kyiv. This combination of comfort and modern style creates specific atmosphere of comfort living in “Hotel Amarant”. Conformance of price and quality, individual attention to every guest, hospitality of staff in combination with exquisite atmosphere and convenience of location – is visiting card of Hotel Amarant. 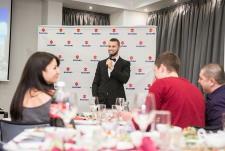 Hotel Amarant in Kyiv - exceptional quality and value for money. 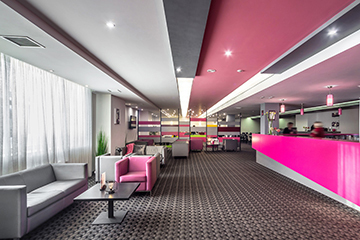 Amarant Hotel is a new, modern, hotel of European style at the business and historical center of Kyiv – Podil. of up to four persons. Comfortable and stylish hotel Amarant is located in the very center of ancient Podil with easy access to most of the city sights. Amarant is perfect for travelers appreciating European standards without having to compromise on service and who desire to stay in stylish hotel. The hotel offers 46 rooms in the following categories: “Standard Single”, “Standard Twin”, “Comfort”, “Comfort Double”. Accommodations differ in exquisite design and the interiors are exquisite and tight-knit. The rooms include ergonomic furniture and bathroom equipment, high quality textile and cosmetics, the newest system of lightning and communication – all these are selected with taste and love. Most of the accommodations have nonstandard layout and color composition, which will delight guests with delicate taste of style. Even the most insignificant details have been thought about – this is the quality distinguishing the hotel Amarant from all others. All rooms include: Wi-Fi high-speed internet (free of charge), broadcasting main world TV channels, orthopedic mattresses, plasma monitors, individual safes, phones, air-conditioning system and hairdryers. Comfortable accommodation is perfectly suitable for those who travel alone and do not want to pay for extra space. “Standard Single” accommodations are located on second and third floors of the hotel. These rooms include all conveniences: single bed, additional sofa bed, air conditioning, hairdryer, satellite television, safe, phone, Wi-Fi Internet. “Standard Twin” rooms are very spacious and offer modern design. The extraordinary range of colors and well designed layout make “Standard Twin” accommodation particularly spacious and light. Besides the two single beds, there is a desk, chair and plasma TV set in each room. Every accommodation has a wardrobe at the entrance giving additional space in the room. “Comfort” accommodations are stylish and tight-knit. The extraordinary color range of the interior, special system of lightning and unique furniture, make these rooms cozy, comfortable and ideally intended for families travelling with children. There are two single beds, additional sofa bed, working table, chair and plasma TV set in each room. Each room has a wardrobe at the entrance giving additional space in the room. “Comfort Double” accommodations are stylish and tight-knit. The extraordinary color range of the interior, special system of lightning and unique furniture, make these rooms cozy and comfortable. 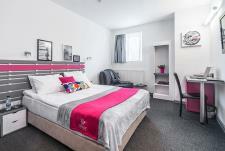 There is one double bed (king-size), additional sofa bed, working table, chair and plasma TV set in each room. Each room has a wardrobe at the entrance giving additional space in the room. 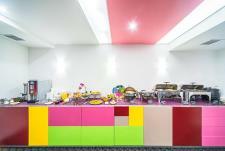 Breakfast buffet with freshly baked pastries and excellent aromatic Italian coffee is included. From 7:30 a.m. till 10 a.m. (Monday-Friday), from 9 a.m. till 11.00 p.m. (Saturday – Sunday) – breakfast, buffet service. From 4 p.m. till 10 p.m. – alcoholic beverages and snacks. For detailed information about our halls and conference services, please click here or call us at +38(044)5001145 and one of our hospitality specialists will contact you shortly. Amarant Hotel 4.6 1 out of 5 18 user reviews.
" Уютные номера, вежливый и приветливый персонал, вкусный и разнообразный завтрак. " " My room was cleaned twice. The towels were not changed. " 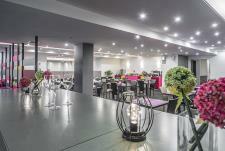 Hotel Amarant is located in a central part of the city: the ancient and historical district Podil. It is especially convenient for guests of the Ukrainian capital as it is located close to the main cultural and historical sights of Kyiv. Kyiv river port, Kyiv Mohyla Academy, mansion of Russian Emperor Peter the Great, Florivsky and Pokrovskyi Convents, restored church of Bogorodytsa-Pirogoshcha, Illinska church (1962), church of Mykola Naberezhnyi, church of Saint Nicholas (Nikoly Prytyska) (1631), St. Cyril's Monastery 12th century (reconstructed in Ukrainian Baroque style by Ivan Hryhorovych-Barskyi in 1760) with elements of medieval interior frescoes, iconostasis of the end of 19th century and murals made by painter Mikhail Vrubel, Kiev funicular, Fountain of Samson, Gostynnyi Dvir etc. The main street which has connected Podil with the upper-town for centuries is Andriyivskyy Descent, which was always considered to be similar to Montmartre in Paris. Here you can always see painters, showing their works, singers and artists and many interesting hand crafts. Most of the foreign state`s embassies are located on Andriyivskyy Descent, many business centers and little bars and cafes, where you can have a good time. The nearest subway stations are – “Taras Shevchenko” and “Kontraktova square”.